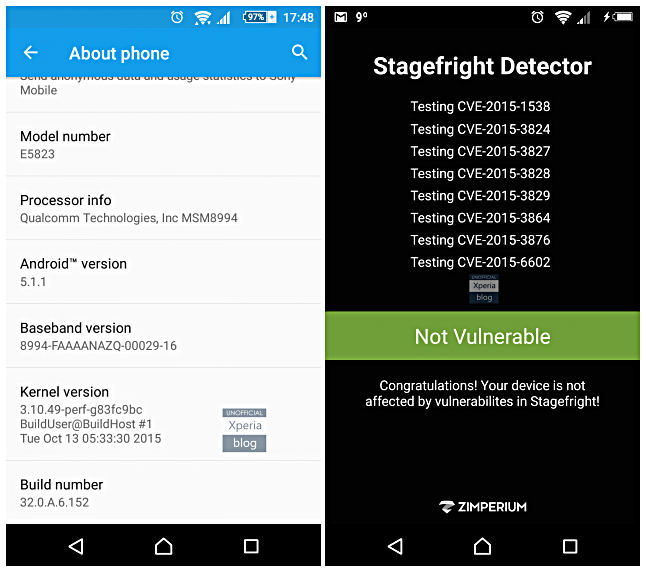 The Sony Xperia Z5 and Z5 Compact smartphones, which were made official last month and released this month, are now receiving a software update which brings along fix for the Stagefright exploit. All variants of the aforementioned handsets along with those of the Xperia Z5 Dual are getting the update. Sized at 281MB and carrying a build number of 32.0.A.6.152, the update - according to certain users who've received it - also enhances camera performance, improves heat management, and makes the fingerprint sensor comparatively more accurate. The OTA update is currently rolling out in several regions, so it should hit your device anytime now if it already hasn't. However, if you're feeling impatient, you can also manually check for it through Sony's PC app. http://www.gsmarena.com/compare.php3?idPhone1=65­38&idPhone2=7535 Z3c works more, dont know why.